I don’t read a lot of books about Sarah Palin. Most fall into two categories: Worthless nonsense looking to cash in on Sarah’s huge popularity, and hit pieces filled with lies and designed to gin up hate for all that is good in the world. So when the new book, The Faith and Values of Sarah Palin: What She Believes and What It Means for America, caught me eye, I approached it with some skepticism. Thankfully, the new book written by Stephen Mansfield and David A. Holland, turned out to be the exception to the rule. 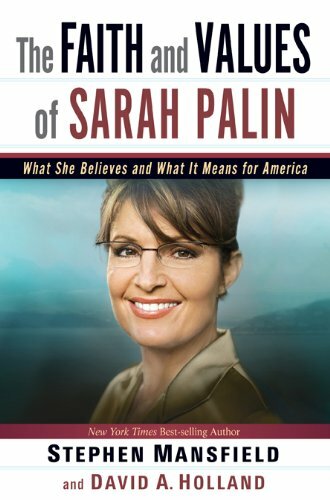 The Faith and Values of Sarah Palin takes an in-depth look at what makes Sarah tic. How she became who she is. The authors had extraordinary access to Sarah’s family and friends, and used this to help us all understand how Sarah’s world view, her vision, was formed. We learn how Sarah’s strong character, her work ethic, was shaped at an early age, as well as her faith. We learn that Sarah was known to carry a copy of Alaska’s Constitution with her at all times, and wasn’t afraid to whip that baby out to make her point, when needed. How refreshing in an age where our president, and members of his party in Congress, see the Constitution as a hindrance, rather than the supreme law of the land! In the book Mansfield and Holland take us from Sarah’s birth, up present day. They talk of Sarah’s path to God, and go into some detail about her time as a young girl and a teen. We learn of her various pastors, and how they shaped her life. On the secular side we learn how things like her families love and respect for the outdoors and her great love for the magnificent state that is Alaska, shaped her as well. We learn how long distance running and playing championship basketball helped hone her determination and endurance. We learn how these sports taught her leadership as well. We also learn a lot about Sarah’s parents, Chuck and Sally Heath. We learn how they were raised, what influenced them. How they came to be in Alaska in the first place. We learn a lot more about Todd, his family, and his Yu’pik heritage. We even get a bit of a history lesson on the Palin’s brand of faith, as well. One of the interesting little bits we learn is that Joshua DuBois, the head of Barack Obama’s Office of Faith Based and Neighborhood Partnerships, and Sarah, share the same Pentecostal faith, along with former Attorney General John Ashcroft. The book isn’t all about religion though. The authors tell the story of Sarah from her youth, through high school, to her marriage to Todd, to her first forays into politics. We learn about her battles against corrupt politicians, and get a behind the scenes look at her management style. No book would be complete without a look at the 2008 election, and we get that too. There is also a fair amount of myth busting in the book, as the authors try to counter the many lies told about Sarah, her family and her faith. With all of this said, this isn’t a “fan book” it takes a pretty objective and serious look at Sarah and her life. There are criticisms, and even some of the old pre-conceived notions that drive us crazy! If I have any real problem with the book, it’s at the end, the Afterword. It’s quite amazing to me that the authors, after writing such a magnificent book, and obviously learning about Sarah’s life and personality along the way, would come up with such pedestrian “advice.” They should have learned from their own research that Sarah does things her way, and gets results when she does. One would think the train wreck that was the poorly run McCain campaign would be proof positive that Sarah’s own political and personal instincts are much better than the so-called professionals! Sarah was “handled” and managed to the Nth degree. It was a disaster, to put it mildly. We see evidence daily what the woman is capable of when she does things her way. Doing things her way, Sarah Palin has become one of the strongest voices in America, one of the most powerful. With that said, you simply must buy this book, because it really does help explain why she has become on of the most powerful figures in the nation. In the long run, Palinistas, her supporters, will love this book and find it only reinforces what they already knew. They will learn some more history and get a better understanding of who Sarah is, and why. They will be greatly moved. Open minded fence sitters should have a new respect for Sarah after the read. Open minded people will see Sarah in a light they may have never seen before. I would think a lot of people will come down off of that fence and get involved after reading this book. I suspect every reader will be motivated and inspired by this story of Sarah Palin. The left will be the most fun to watch, as the mere mention of religion makes their heads explode. This book will send them into convulsions! To sum it all up, you need to read this book. It’s well written and quite informative. Overall, well worth the time. You can order from Amazon or go to your local bookstore. Mansfield also appeared a few days ago on Hannity and spoke with Sean Hannity about The Faith and Values of Sarah Palin. This is a great interview, and among other things, Mansfield talks about Sarah and the Eskimo culture that sees women as wise leaders, who are almost mystical in powers. For the press: Yes, I shall invoke Ronald Reagan again, and again, and again! You won’t hear me invoke Alinsky or Mao! Sarah Palin spoke to a packed house in Anaheim, California at the RNC rally this Saturday afternoon. The speech, which was carried live on both network and cable news outlets is one of her most powerful yet. The crowd was wild and ready to go to work to ensure a huge victory two weeks from now. Sarah hit every note pitch perfect. Dare I say she was incredibly presidential, and sounded exactly like the great Renaldus Magnus. Infusing powerful ideas with a bit of humor, and an incredibly upbeat tone, Sarah Palin, like The Gipper, is an eternal optimist. Sarah believes in America’s greatness and exceptionalism. America IS that Shining City on a Hill that Reagan so loved to speak of. All interviews are available 24/7 at the archive at SarahPalinRadio.com. Please support your local conservative candidates. Sarah Palin Radio’s Podcasts are listed in the US for Palin left-hand sidebar. Bristol will be dancing the Jive in tomorrow’s broadcast. As of this writing, she has 8,607 Facebook friends. Sarah Palin’s Alaska Sneak Preview retrieved from PalinTV. Sarah, Todd, and Piper Palin, and McKinley encounter a mama grizzly while fishing in this sneak preview for Sarah Palin’s Alaska. Below is the video of a Sean Hannity segment, retrieved from PalinTV. Stephen Mansfield was a guest on the television show to discuss The Faith and Values of Sarah Palin, the new book he and David A. Holland co-authored. The interview was of special interest to me because I’m currently reading the book and am fascincated by the things the authors learned through exclusive access to Governor Palin’s parents, siblings, friends, and pastors who have all played a role in who she is. 1. Family has fashioned her soul. 2. Alaska and the idea of the state are primary for Palin. 3. Palin has been influenced by the Eskimo view of women. 4. Palin lives and leads from a sense of divine destiny. Mansfield discussed with Hannity the moment as a child when Governor Palin sensed a call to politics. He shared the difference between President Obama’s extremely liberal theological perspective and Governor Palin’s Pentecostal-rooted faith. And he commented on the video that surfaced during the 2008 campaign where she was being prayed over, which led to the lamestream media’s completely unfair and severely uneducated characterization of the Governor’s faith. The Faith and Values of Sarah Palin has been an interesting read so far for me, as it points out the fact that when a person’s faith truly matters to her–is truly a reality in her life–it cannot help but fashion how she views the world, how she operates within the world, and the impact she’ll leave upon it.